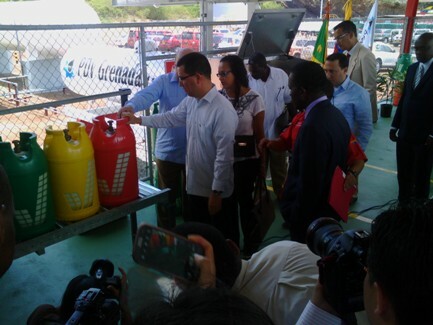 Almost 10 years after Grenada signed the PetroCaribe agreement with Venezuela for cheaper oil products, it has now ventured into a second product — the commissioning of an LPG plant. The first product was diesel which is used solely by GRENLEC. “Since our agreement, we have been importing one product — diesel. The opening of this plant means that we will soon start importing our second product under the agreement. This is both timely and necessary,” said Energy Minister, Prime Minister Dr Keith Mitchell, at the symbolic opening ceremony of the Hugo Chávez PetroCaribe/PDV LPG Plant which will be paid for by the Government of Venezuela. “The objective of introducing this LPG product today, as per the PetroCaribe facilitation, is to revolutionize the use of clean energy in Grenada at an affordable price to households. The new cylinders are not only affordable, but they are also safer, user-friendly and last longer,” said Dr Mitchell. Trade Minister Oliver Joseph explained that the “vision” cylinders which will carry 24 pounds of gas, are both fire and bulletproof. This is the new line of LPG composite cylinders category from Gavenplast de Venezuela, with its new state of the art plant to meet market demand worldwide. “Ladies and gentlemen, we will continue the quest to replicate what is happening here today in different avenues that amount to the same end goal: energy options for our citizens — in whatever areas of use. We are again grateful to our friends from the Bolivarian Republic of Venezuela for understanding that. Our relationship is one that is deeply rooted in mutual respect and the improvement of the lives of the poorest among us,” said Prime Minister Mitchell, in the ceremony which was witnessed by a delegation from Venezuela led by Vice President Jorge Arreaza. In his message, Arreaza gave the assurance that Grenada will continue to get supplies from Venezuela, once it’s available. “PetroCaribe is a socialist method. Venezuela has the greatest oil reserve in the oil and as long as we have energy, Grenada will have energy,” he said. Referring to the declaration from the USA that Venezuela is a national threat, Arreaza said that Venezuela is not a threat to any territory. The plant, which will cost EC$10.2 million upon final completion, is expected to serve 15% to 20% of the Grenadian market according to Ambrose Louis–Obike, Chairman of PetroCaribe Grenada. The first target will be vulnerable persons who presently cannot afford gas cookers, while schools will be provided with free gas. No date is set as yet to start serving customers.